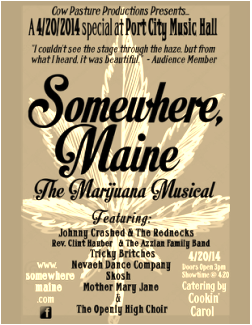 January 10, Somewhere, ME – Cow Pasture Productions was pleased to announce the opening night gala for “Somewhere, Maine: The Marijuana Musical”; a dramatic look at one year on a marijuana farm in the hills of Western Maine, and home to outlaw country music singer, Johnny Crashed. Johnny battles with reality as he deals with the loss of his two children who were taken from him for the crime of being a pot farmer. The musical features a host of characters including: Jezebel, a newly arrived home schooled Christian girl who is seeking souls to save through song and dance; Redneck, a long time hell raiser and drug dealer seeking a unique kind of revenge; Mother Mary Jane, a local sensuous "healer" who operates a Smoke Easy in Normal, Maine, and Joe Oliver, a returning veteran who is battling his demons, along with many more. The stage production features the original music and lyrics of Johnny Crashed with choreography by the Nevaeh Dance Company, and the debut of The Openly High Choir. The musical will feature many of Maine's best bluegrass/country musicians as Johnny's backup band "The Rednecks" --including Cliff Randal on mandolin, Jack Jolie on guitar, Colin Thompkins on bass, and Eric Grenier on harmonica. The opening for this groundbreaking event took place on April 20th (4/20) at the Port City Music Hall. In addition to the musical, the gala featured music from the Azzland Family Band, Tricky Britches, and Skosh. Find out more about some of the people of Somewhere, Maine who play music and/or collaborate with Johnny Crashed here!